Morning Folks. Having issue a member might of experienced and has solution. I have a 2 week old I2/x7/Ipad mini 4 setup. All on latest firmware. 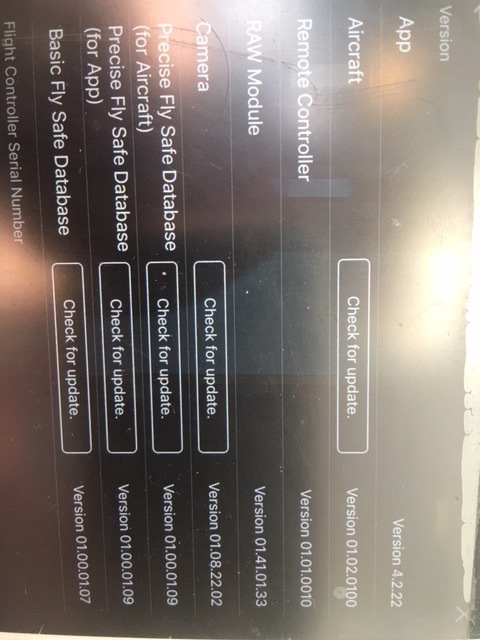 Advised by heliguy to do full reset of iPad. This worked for one day of work and then the issue returned 2 days later for next job. Reset both tablets again and drone worked fine last Friday. Startup today and disconnect problem has once again returned. Any solutions or suggestions will be greatly appreciated. I&apos;m having the same issue, every 5 minutes for me, only started happening when I upgraded to IOS 1.4. DJI advised me to delete and re-load the app, I&apos;ve done that but not had a chance to test it yet. Hello there. We apologize for the inconvenience you&apos;re having. 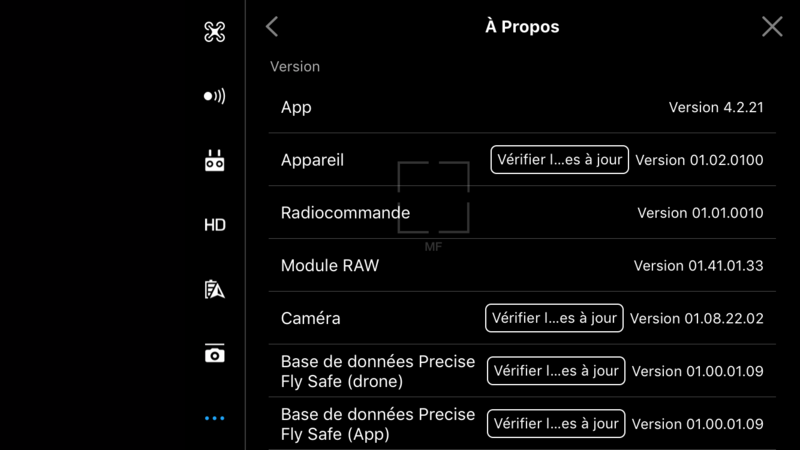 Can you provide the firmware version of your aircraft, camera, remote and app? Did you also try to re-mount the camera? I just tested my iPhone 7 ios 11.4 with GO4 version 4.2.16 and it works. I managed to roll back DJI GO4 to 4.2.12 on my tainted iPad air (ios 11.4)and will test that later this week. It seems to be a combination issue. 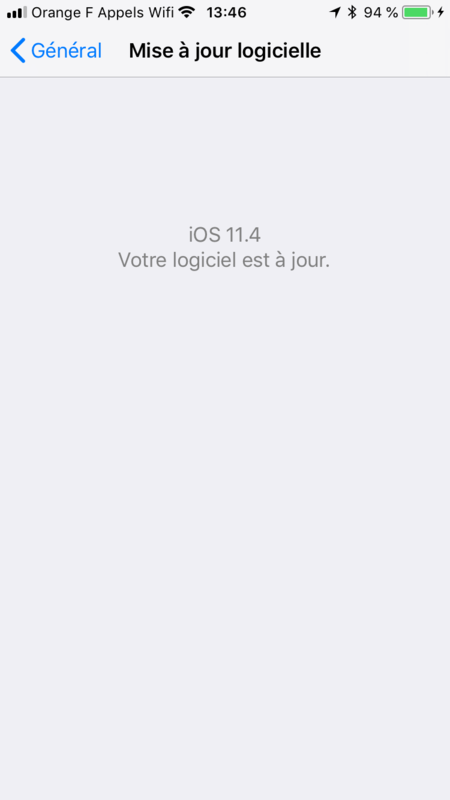 ios 11.3(15E216) with GO4 version 4.2.22 works but not with ios 11.4.
ios 11.4 with GO4 version 4.2.16 works on my iPhone 7 plus. I have a the same problem when connecting the radio with the Inspire 2 which remains grounded because of this. It was not necessary because the firmware of the Inspire 2 drone was up to date, but I redid Inspire 2&apos;s update via Assistant 2. Again the problem has always reappeared with the Ipad mini (16go), when I started the device, the connection was lost after a few seconds, once the app DJIGO4 launched, then nothing, the signal is lost, nothing answers. I restarted with the iphone 6, it worked for a few minutes, and the signal was lost again. So, I uninstalled the DJIGO4 app on the Ipad to reinstall it then, without result. The problem is that I have a shoot this important weekend that I can not shift. I can shift the job last weekend that I could not realize, but not the next weekend, it&apos;s very annoying. My clients will ask questions, and I find myself discredited. What remains as a solution? Not sure, but my friend and myself have identical equipment, Inspire 2 with X5S and Cendence RC, booth running iPad Pro 10,5 with 256 GB (wifi) with IOS 11.4. My friend is running Go4 v. 4.2.22 and I am running Go4 v. 4.2.16. Neighter one of us have any issues with disconnections, to me it almost look like the GO4 app is to bloated and in conjuntion with IOS 11.4, requires much more processing power. Hello, single or double the problem is the same. The disconnection is done anyway. It seems that the problem does not affect the iPhones X.
I noticed that you were asking about all the conversations, the versions of updates of our devices. Out of curiosity, what is your video Transmission set to, 720 or 1080? Thx for confirming, just trying to see why some people have issues. I can&apos;t replicate, mine is working without any such problems, weird. Edit: I have tried iPad Pro 10,5 as well as iPad Mini 4, booth running IOS 11.4. Used Go4 apps 4.2.16, 4.2.21 and 4.2.22 and all works without issues. My problems were with iPad mini 4, iOS 11.4 dji Go 4.2.21. Worked for about a day after full reset and reload of iPad. Then after a days flying back to disconnect problem 1-2 days later. I have been trialling it in the office without flight for 3 days now with DJi Go 4.2.22. Seems OK. Will know tomorrow and next day after some flying. Hope your issue is solved, I will do some more flying tomorrow (to hot right now) and use the Mini 4. Same issue here, running an iPhoneX on 11.4 and 4.2.22. Hopefully they&apos;ll get this fixed soon because it&apos;s a freakin pain. Had to have my VO stand next to me and do an unplug/plug back in it would kick me out during a shot. As per my original post, iOS 12 has fixed this and it’s still working on public beta 2. I would suggest anyone who has issues to upgrade to the beta. Of course DJI should either come out and say the go app is not compatible with iOS 11.4 or make it a priority to fix it. Either way it’s a pain for us who have updated to 11.4. Plus 1 for this issue .. Inspire2/Ipad4 Mini/Latest Go4. Disconnected twice during 1 flight. I seemed to have a disconnection issue this evening.... I have an i2, using crystalsky ans x5s.... Only ever had issues like this once before, the app seemed to lock up and stutter.... the tonight I turned it all on, no picture from the camera and it said “disconnected” top left. I reset everything and it all came on fine. Took off, and it lost it again so I landed and turned it off and went home..... but it’s only happened in this one area, could this be a coincidence ? It seems you deleted my post asking for a response after going quiet on this issue and criticising your lack of customer service in light of so many customers having disconnect issues. With no help from DJI. Please respond and get your customers out of this disconnect hole. Hi. I apologize for the late response. I already forwarded this issue to our engineers. We will keep you updated. Thank you for the reminder. I am not sure if this will help much but I am having the same problem. I fortunately had an older iPad that I just stopped using because I was getting the green screen while shooting so I decided to get a new iPad with a faster processor. That fixed the problem and all was good until i updated the iOS to 11.4. Now I get this disconnect issue. It does the same thing with my P4P. So, just for the heck of it I tried the old iPad and low and behold no disconnect issues and I used the drone for about 3 10 minute flights. Still had my same past issues but the disconnect issue was gone. Since my new iPad was still in the 2 week return period I returned it hoping to get an iPad that still had 11.3.1 on it but the store can not tell without opening the box and they are not going to do that of course. So I took a chance. Got home and the NEW NEW iPad was on 11.4. BUT!! !, it works just fine on the inspire 2. No disconnects. So the only thing I can think of is that I had not loaded but just a few apps and that is the only difference between this one and the one I just returned. I know it sounds ridiculous but I have no other explanation. Perhaps that is why it works when you reset the iPad but then after a while it stops working again which begs the question, are you loading some apps after the reset other than DJI G4? Might be worth leaving the iPad fee of apps other than the DJI G4 app to see. At this point, what do you have to loose. We are using the iPad when it was disconnecting so the lock screen was not in effect. I am having the same diconnect issues using DJI GS Pro. Using both iPad mini 2 and 3 after IOS updates. The Inspire 2 will continue to complete a mission but there is no camera view or telemetry feedback, and the flight path freezes. Unplugging and replugging corrects the connection temporarily. When flying missions requiring multiple batteries I have had to rely on auto return to home if I can&apos;t monitor battery level. DJI!!! Please fix this!!!! Is your auto screen lock off? iOS 11.4.1 just dropped a few days ago so maybe upgrade and test. If it is not working with 11.4 then you have nothing to loose at this point.